What nosy person can resist reading a tiny message hidden under a postcard stamp a hundred years ago?? I could make out a little bit — last night, please please, sad — but I thought seeing the rest of the postcard up close would help me get a better feeling for the writer’s hand. I asked Pamela to send me an image of the full postcard so I could get a little closer, and she obliged. I spent a good two hours trying to figure it out, using a book of old German handwriting examples to guide me. I made some progress, but only solved about half of the puzzle. Contextual clues can help you a TON with deciphering old handwriting, so my knowledge of German really helped. But the letterforms of old German handwriting like this, called Kurrent — or the even weirder Sütterlin — are so vastly different from modern English letterforms that I made a lot of wrong turns and had to backtrack. For example, I at first read the city as Wien — German for Vienna — but she determined it actually says Hier — here, meaning the same city! Also, the name on the address, Gretel Schardt, is written in a slightly more French script than the rest of the postcard, presumably for fanciness. Then I happened to go to a hand-lettering and calligraphy meetup here in Berlin just for fun, and one of the attendees turned out to be studying old forms of German handwriting. Jackpot! With Petra‘s help, I was able to achieve a nearly full transcription. und bin es auch Heute morgen noch. Last night the crying came closer [??]. Please please don’t make such a sad event. I can’t see it. So dramatic! It really made me want to know whatever happened to those crazy kids. Did Gretel ever forgive the nameless writer? The date on the postmark was removed with the stamp, so we don’t have an exact date for this postcard, but from the handwriting and what I can see of the mark, I believe the postcard was written in the decade of 1910 and was posted from Wiesbaden. Thanks to my Family Tree Magazine connections, I did a little digging for Gretel Schardt of Wiesbaden. No good results came up on Ancestry.com or FamilySearch, but then I remembered Gretel can be a nickname for Margarete in German. A new search returned a woman named Maria Margareta Katharina Aloisia Schardt, born 1895 in Wiesbaden, who married Peter Josef Jung there in 1921. (Click on the photo at right to enlarge the scan of the marriage record.) Could these be our lovebirds?? I hope they made it. 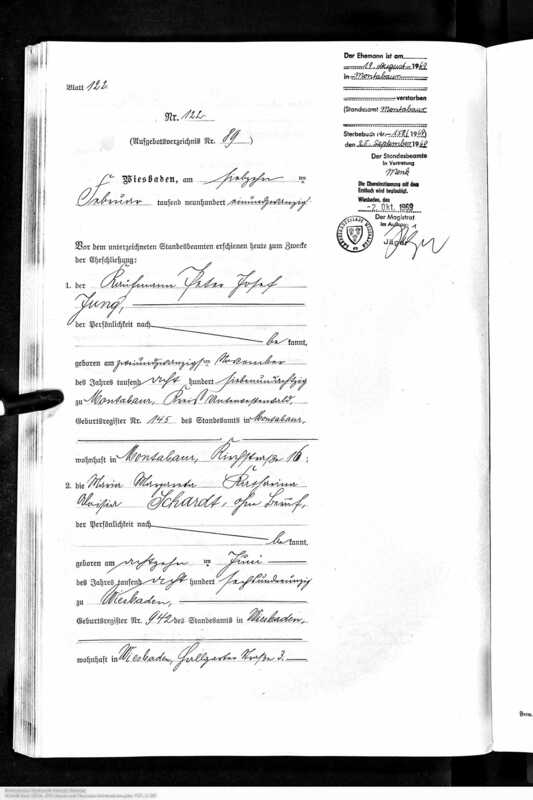 You can see more examples of German handwriting here, learn Kurrent yourself, or try Stephen P. Morse’s autotranscriber.